The Chamonix based ENSA has just announce the 46 new traininee guides for France. Amongst the list of names on the ENSA website is Karine Ruby. Karine won Olympic gold for snowboarding at Nagano in 1998. The first time this event had been included in the Winter Olympics. She topped it up with silver in Salt Lake four years later. Now retired from competitive snowboarding following injuries in a boarder cross event she won won six world titles during her career. Originally from Bonneville in the Haute-Savoie, Ruby is now based in the mountain sports mecca of Chamonix. She has been drawn to climbing and adventure snowboarding and works d for both Decathlon (Wed’ze) and Eider as a technical adviser. In 2006 she was selected by the French Mountaineering Federation (FFME) for their elite ENFA (Equipe nationale filles d’alpinisme - National Girls Climbing Squad) group. This summer she was spotted on L’ascenseur » a 7A climb above the Foron in the Haute Savoie that is a rights of passage for serious climbers. During her probation period Ruby can operate as a professional, taking paid clients. 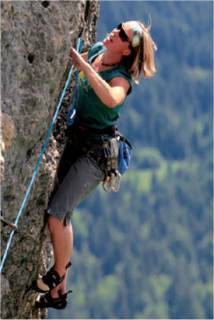 There are less than 20 female mountain guides qualified in France through the ENSA. Less than 1% of the total. Ruby, standing 165cm and weighing just 61 kg would have found the training, such as crevasse rescue, physically challenging.